The year and a half ago a Deaf man named Jason Gurlich moved to Greenville, South Carolina. He wanted to see a thriving Deaf community coming together to make new friends and reunite with old ones. 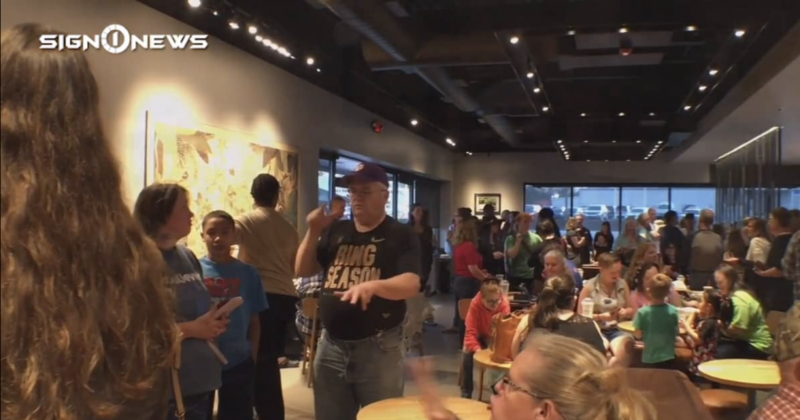 So we sent out one Facebook post for “Signing Starbucks Night” and hundreds of people from all walks of life showed up. Sign1News anchor Crystal Cousineau and MMJ Martha Anger traveled to South Carolina to see firsthand what the excitement was all about. We found out the idea came from a story Sign1News aired a few months ago. If you want to check out the next Signing Starbucks Night in Greenville, South Carolina, it is Friday, April 26 from 6 PM until the lights are turned off. The address is 2405 Laurens Road, Greenville, SC. And Jason, thank you for making Sign1News feel so welcome.